Update website architecture and resolve YaleSites template layout issues. 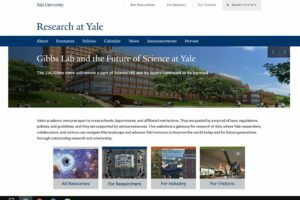 Research at Yale is an audience-driven web portal developed for the Provost’s Office to centralize information about Yale’s research processes and resources. This site is primarily a catalog of hundreds of links and required a robust architecture, taxonomy, views, and paragraph display to manage, filter and display the content. It also utilizes the university’s Bedework and RSS feeds to display customized calendar and news pages. 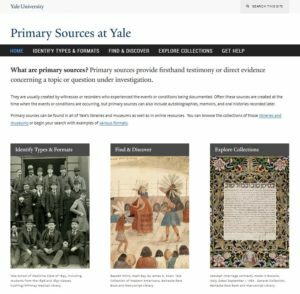 I worked with a committee of staff from Yale’s archives, libraries and museums to create this portal website to bring together resources and information about primary source material throughout the university. This visually appealing site uses the basic YaleSites Drupal 7 template with CSS customization to help users navigate quickly through the portal to the content resources available elsewhere in the university’s webspace. Accessibility and Usability were the guiding principles in the site design and architecture. Migrated a complex, content-rich static website into the YaleSites Drupal platform. 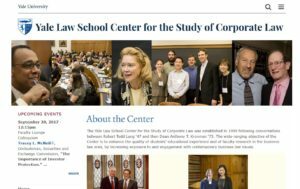 Working with faculty and staff from the Law School, I developed the information architecture that leverages Drupal’s features to manage, publish, document and archive all of the center’s activities. 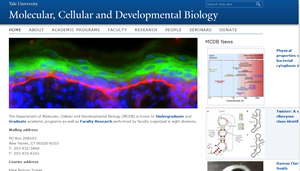 Migrated the Koerner Center’s static HTML website into Yale University’s Drupal 7 environment. 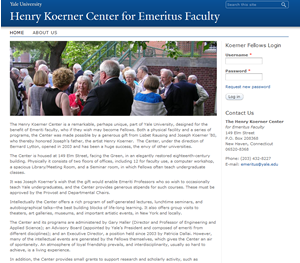 Set up a role-based system for Koerner Center Fellows to access restricted content (calendars, events, directories, etc.). Customized Drupal views, content types, blocks for display. 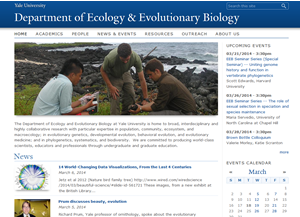 I organized and built Drupal 7 websites for Faculty within the Department of Ecology and Evolutionary Biology. Each site involved working with faculty to customize Drupal to present their research, publications and lab materials as they needed. These sites all utilize Drupal’s Biblio module to manage extensive lists of publications. 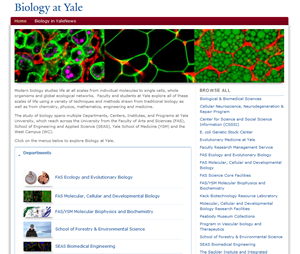 I worked with a committee of faculty, staff and graduate students from the Yale University Department of Ecology and Evolutionary Biology (EEB) to migrate their old website to the Yale’s Drupal 7 platform. This required a complete redesign of the site architecture and synthesizing content from several existing websites into a single easy-to-navigate site. 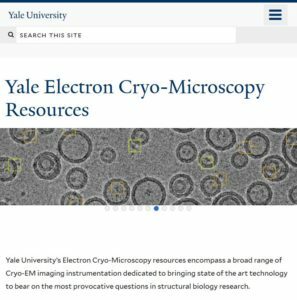 I customized Drupal views, content-types, CSS, blocks and more for this site’s particular needs, and coordinated a somewhat complex production roll-out with Yale IT staff. 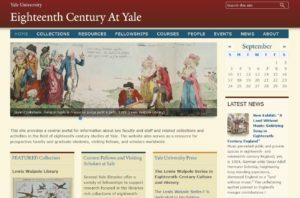 Worked with faculty to migrate the department’s website into Yale University’s Drupal 7 CMS. Reorganized the content, added new functionality, customized views, content types, taxonomy and more. Configured Biblio module to import and display collected faculty publications. Coordinated move to production with Yale IT staff.